East Hanover, N.J., June 11, 2015 / PR Newswire / — Novartis announced today that the US Food and Drug Administration (FDA) has approved Promacta® (eltrombopag) for the treatment of children six years and older with chronic immune thrombocytopenia (ITP) who have had an insufficient response to corticosteroids, immunoglobulins or splenectomy. Promacta was approved by the FDA in 2008 for use in adult patients with the same condition4. ITP affects as many as 5 in 100,000 children each year2 and is characterized by a low platelet count1. Up to 30 percent of affected children experience persistent disease for more than 6 months and are diagnosed with chronic ITP2,5. Pediatric patients with chronic ITP are at ongoing risk of significant bleeding3. The approval of Promacta was based on data from two double-blind, placebo-controlled trials, including the largest Phase III clinical trial in this patient population. Treatment with Promacta significantly increased and sustained platelet counts among some pediatric patients with chronic ITP, and some patients taking concomitant ITP medications were able to reduce or discontinue their use of these medications, primarily corticosteroids. Promacta should be used only in those whose degree of thrombocytopenia and clinical condition increase the risk for bleeding. Promacta is a once-daily oral thrombopoietin (TPO) receptor agonist that works by inducing stimulation and differentiation of megakaryocytes (large cells, found especially in bone marrow) from bone marrow stem cells to increase platelet production4. Please visit http://www.pharma.us.novartis.com/product/pi/pdf/promacta.pdf for Promacta full Prescribing Information. PETIT was a Phase II, multi-center, three-part study to investigate the efficacy, safety and tolerability of Promacta in pediatric patients with previously treated chronic ITP. Part 1 was an open label, dose finding study; Part 2 was double-blind and placebo-controlled, and Part 3 was an open-label extension. The primary endpoint, which was percentage of participants who achieved a platelet count >=50 Gi/L without rescue therapy at least once between Weeks 1 and 6, was met by 63% and 18% of Promacta and placebo patients, respectively (p=0.0043). The secondary efficacy endpoint analyses demonstrated clinically meaningful benefit in terms of decreased need for rescue treatment (14% of patients on Promacta compared to 59% of patients on placebo). PETIT2 was a Phase III, multi-center, two-part study to investigate the efficacy, safety and tolerability of Promacta in pediatric patients with previously treated chronic ITP. Part 1 was randomized, double-blind and placebo-controlled and Part 2 was an open-label extension. The primary endpoint, which was percentage of participants who achieved a platelet count >=50 Gi/L without rescue therapy for at least six out of eight weeks between Weeks 5 and 12 of Part 1 of the study, was met by 43% of patients treated with Promacta and 4% of patients treated with placebo (p=0.0011). This result was consistent across the age cohorts. The secondary efficacy endpoint analyses demonstrated clinically meaningful benefit in terms of decreased need for rescue treatment (18% of patients on Promacta compared to 22% of patients on placebo), and reduction or discontinuation of baseline ITP medications (50% or 5/10 patients in the open-label phase who were receiving other ITP therapy at baseline) over the randomized and Promacta-only treatment periods. In both studies, safety was consistent with the known safety profile of Promacta in chronic ITP in adults and the population under study. No new safety signals were detected. The most common adverse reactions in pediatric chronic ITP patients six years and older (greater than or equal to 10% and greater than placebo) were upper respiratory tract infection, nasopharyngitis and rhinitis. 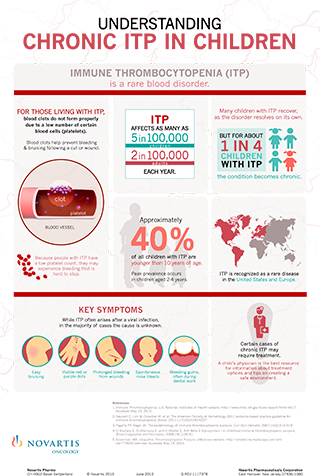 ITP is a blood disorder characterized by blood that does not clot as it should due to a low number of platelets. People who have ITP often have purple bruises or tiny red or purple dots on the skin. They also may have nosebleeds, bleeding from the gums during dental work, or other bleeding that's hard to stop. In most cases, an autoimmune response is thought to cause ITP in which a person’s immune system attacks and destroys its own platelets1. The two types of ITP are acute (temporary or short-term) and chronic (long-lasting). Acute ITP mainly occurs in children, often after a viral infection, and generally lasts less than 6 months. The platelet count returns to normal within 6 to 12 months and treatment may not be needed1. However, up to 30% of teenagers and children with ITP experience persistent disease for more than 6 months and are diagnosed with chronic ITP2,5. The goal of treatment in chronic ITP for children is to maintain a safe platelet count that stops or prevents bleeding1. The most commonly available and used therapies–corticosteroids and intravenous immunoglobulin (IVIG)–are associated with side effects that are often difficult to tolerate in a pediatric setting3,6,7. Promacta is marketed under the brand name Promacta® in the US and Revolade® in most countries outside the US. Promacta is a prescription medicine used to treat adults and children 6 years of age and older with low blood platelet counts due to chronic immune (idiopathic) thrombocytopenia (ITP), when other medicines to treat ITP or surgery to remove the spleen have not worked well enough. Promacta is used to try to raise platelet counts in order to lower the risk for bleeding. Promacta should be used only in those whose degree of thrombocytopenia and clinical condition increase the risk for bleeding. It is not known if Promacta is safe and effective in children younger than 6 years with ITP. Separate applications were submitted to the FDA and the European Medicines Agency (EMA) earlier this year to include chronic ITP patients one year and older. These applications include chemistry, manufacturing and control (CMC) data supporting the new powder for oral suspension formulation of Promacta. 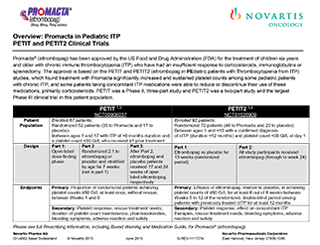 The safety and efficacy profile of Promacta has not yet been established in countries outside the US in pediatric patients with chronic ITP. For various reasons, including the uncertainty of clinical trials, there is no guarantee that Promacta will become commercially available for pediatric patients with chronic ITP anywhere else in the world. Information about clinical trials for chronic ITP can be obtained by healthcare professionals at www.clinicaltrials.gov. In addition to the approval of Promacta for chronic ITP in the US, it is approved to treat low blood platelet counts in people with chronic hepatitis C virus (HCV) infection before and during treatment with interferon. Promacta should only be used in people with chronic hepatitis C whose low blood platelet counts keep them from starting or continuing interferon-based therapy. It is not known if Promacta is safe and effective when used with other antiviral medicines that are approved to treat chronic hepatitis C.
Promacta is a prescription medicine used to treat people with severe aplastic anemia (SAA) when other medicines to treat SAA have not worked well enough. Promacta is not used to make a patient’s platelet count normal. The most common side effects of Promacta in children 6 years and older when used to treat chronic ITP are: upper respiratory tract infections (symptoms may include runny nose, stuffy nose, and sneezing); pain or swelling (inflammation) in the nose and throat (nasopharyngitis); runny, stuffy nose (rhinitis); stomach (abdominal) pain; cough; pain or swelling (inflammation) in the throat or mouth; toothache; abnormal liver function tests; diarrhea; rash; vitamin D deficiency. The most common side effects of Promacta when used to treat severe aplastic anemia are: nausea, feeling tired, cough, diarrhea, headache, pain in arms, legs, hands or feet, shortness of breath, fever, dizziness, pain in nose or throat, abdominal pain, bruising, muscle spasms, abnormal liver function tests, joint pain, and runny nose. Laboratory tests may show abnormal changes to the cells in bone marrow. 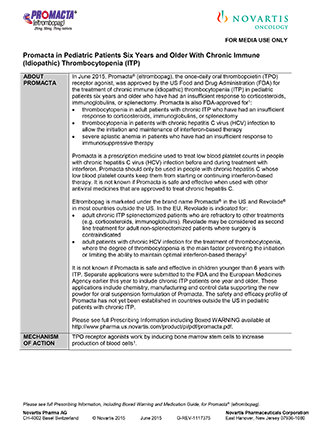 The foregoing release contains forward-looking statements that can be identified by words such as “can,” “ongoing,” “hope,” “commitment,” “goal,” “yet,” “will,” or similar terms, or by express or implied discussions regarding potential new indications or labeling for Promacta, new formulations of Promacta, or regarding potential future revenues from Promacta. You should not place undue reliance on these statements. Such forward-looking statements are based on the current beliefs and expectations of management regarding future events, and are subject to significant known and unknown risks and uncertainties. Should one or more of these risks or uncertainties materialize, or should underlying assumptions prove incorrect, actual results may vary materially from those set forth in the forward-looking statements. There can be no guarantee that Promacta will be submitted or approved for any additional indications, labeling or formulations in any market, or at any particular time. Nor can there be any guarantee that Promacta will be commercially successful in the future. In particular, management’s expectations regarding Promacta could be affected by, among other things, the uncertainties inherent in research and development, including unexpected clinical trial results and additional analysis of existing clinical data; unexpected regulatory actions or delays or government regulation generally; the company’s ability to obtain or maintain proprietary intellectual property protection; general economic and industry conditions; global trends toward health care cost containment, including ongoing pricing pressures; unexpected manufacturing issues, and other risks and factors referred to in Novartis AG’s current Form 20-F on file with the US Securities and Exchange Commission. Novartis is providing the information in this press release as of this date and does not undertake any obligation to update any forward-looking statements contained in this press release as a result of new information, future events or otherwise. Novartis Pharmaceuticals Corporation researches, develops, manufactures and markets innovative medicines aimed at improving patients' lives. We offer a broad range of medicines for cancer, cardiovascular disease, endocrine disease, inflammatory disease, infectious disease, neurological disease, organ transplantation, psychiatric disease, respiratory disease and skin conditions. The company's mission is to improve people's lives by pioneering novel healthcare solutions. Located in East Hanover, N.J., Novartis Pharmaceuticals Corporation is an affiliate of Novartis AG, which provides innovative healthcare solutions that address the evolving needs of patients and societies. Headquartered in Basel, Switzerland, Novartis offers a diversified portfolio to best meet these needs: innovative medicines, eye care and cost-saving generic pharmaceuticals. Novartis is the only global company with leading positions in these areas. In 2014, the Group achieved net sales of USD 58.0 billion, while R&D throughout the Group amounted to approximately USD 9.9 billion (USD 9.6 billion excluding impairment and amortization charges). Novartis Group companies employ approximately 120,000 full-time-equivalent associates. Novartis products are available in more than 180 countries around the world. For more information, please visit http://www.novartis.com. 1. Immune Thrombocytopenia. US National Institutes of Health website. http://www.nhlbi.nih.gov/book/export/html/4917. Accessed May 19, 2015. 2. Fogarty PF, Segal JB. The epidemiology of immune thrombocytopenic purpura. Curr Opin Hematol. 2007;14(5):515-519. 3. Neunert C, Lim W, Crowther M, et al. The American Society of Hematology 2011 evidence-based practice guideline for immune thrombocytopenia. Blood. 2011;117(16):4190-4207. 5. El-Bostany E, El-Ghoroury E, and El-Ghafar E. Anti-Beta 2 Glycoprotein I in childhood immune thrombocytopenic purpura. Blood Coagul Fibrinolysis. 2008;19(1):26-31. 6. Provan D, Stasi R, Newland AC, et al. International consensus report on the investigation and management of primary immune thrombocytopenia. Blood. 2010;115(2):168-186. 7. Cines DB, Blanchette VS. Immune thrombocytopenic purpura. N Engl J Med. 2002;346(13):995-1008.